Marvel Comics Universe & May 2019 Solicitations Spoilers: War Of The Realms Leads To New All Asian Agents Of Atlas To Protect The Pacific Rim! War Of The Realms Leads To New All Asian Agents Of Atlas To Protect The Pacific Rim! Featuring the Marvel Comics debut of Luna Snow, Aero, Sword Master, and more new Super Heroes! This April, Earth becomes a battlefield as Malekith’s forces lay siege upon our planet in WAR OF THE REALMS—the most all-encompassing, Universe-shaking event to hit the mighty Marvel Multiverse in years! Introducing the NEW AGENTS OF ATLAS! Written by Greg Pak with art by Gang-Hyuk Lim and a cover by Billy Tan, WAR OF THE REALMS: NEW AGENTS OF ATLAS #1 unites new and classic heroes to kick off the four-issue WAR OF THE REALMS tie-in series this May! Featuring the Marvel Comics debut of the Super Heroes called Wave, Aero, and Sword Master, the story sees Amadeus Cho reassemble his “protectors” to save the world from incineration. Cho has successfully led a ragtag team of heroes to defend the Earth from an alien invasion in the past, but can he do it again this time? 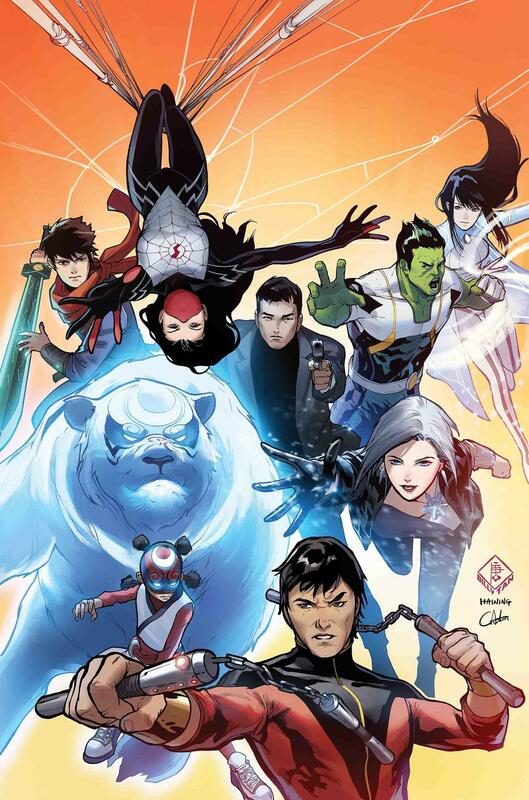 Shang-Chi, Silk, and Jimmy Woo quickly join Brawn in the fight…but where is Kamala Khan? Meanwhile, new heroes Crescent, Io, and Luna Snow are making their own entrance into the Marvel Universe, so how will they impact the global conflict? Get to know this brand-new union of Super Heroes as Marvel’s newest heroes from China, Aero and Sword Master, team-up with a mysterious new Filipino heroine named Wave in the crazed crucible of WAR OF THE REALMS! Then, in WAR OF THE REALMS: NEW AGENTS OF ATLAS #2, the Queen of Cinders has conquered Korea and the rest of Asia! Now, only Amadeus Cho and his battered band of international Super Heroes stand between her and her ultimate goal: to melt the polar ice caps and turn all of Midgard into a sweltering new Muspelheim!